I am in Hudson, Ohio for a quick one day trip here with JoAnn. I wanted to share about IU. This past weekend was the Vegas event. It was a growing experience for me in more ways than one. I always feel we are daily given opportunities to show our strength, our heart, our kindness and just grow from each experience. This past weekend was the last... the end of INSPIRATION UNLIMITED. It was and is sad that after all these years, there will be no more IU. I did not know that it would be the last year or I would have announced it. As many of you know that with business and life changes... things happen. I want to thank Ginger Nelson and support her in all that she is doing and her online store and crops Down to Details. I wish her the greatest success because she deserves it. I met her years ago at an event and I will truly miss her. She was the over the top fun event coordinator. It is sad for me, but I respect her decision. I only wish I had known so I could have publicly given her a HUGE fan fair and announced properly that IU was no longer going to happen again to everyone. IU was "Ginger & I" and without us as a team, I knew IU would not be the same. 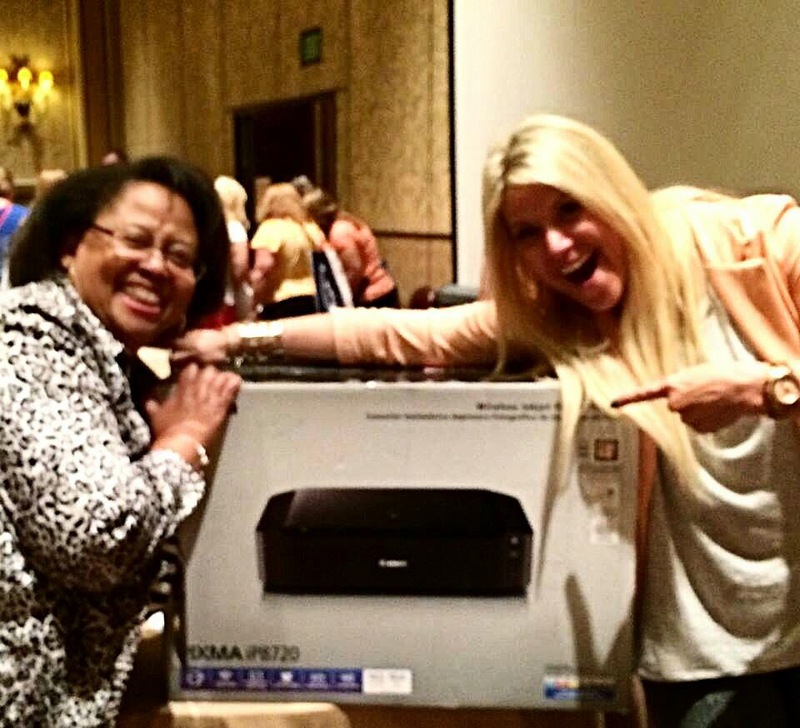 I wanted to thank the amazing teachers that came this year to the event. I am fortunate to call many of them dear and close friends. I look up and hope to get know the others the same way. Thank you Jodi Sanford, Heidi Swapp, Kelli Collins, and Paula Cheney. Such a honor to have you at the event. There were pre- IU workshops taught by Vicki Boutin, Layle Koncar, Robin Huber, Kimber McGray, Joey Otlo that was a huge success. YOU are GOLD... each of you are sharing so much. THANK YOU! This is a song that speaks to me about BEING GOLD!!! I had talked to my partners and they overwhelmed me with offers to support any events that I do. It made me so happy to give back to those that came this year to IU. Every person at the event got a TC white tote bag with "Teresa's Favorite Things" gifts- new TC Fiskars PINK/WHITE stripped scissors and TC Fiskars mini star punch and more! TC WRMK GOLD foil HEART 4x4 instagram album and instagram 4x4 card kit, Xyron gave everyone their PURPLE sticker maker, and I was able to get two CAMEO machines from Siloquette, Craftwell donated two TC cut n boss machines, American Crafts was so generous WRMK with my albums, and CANON gave away selphy printers and Canon printers Canon Pixma iP8720 and the white office ones too. We had so many sponsors that night and for the event. 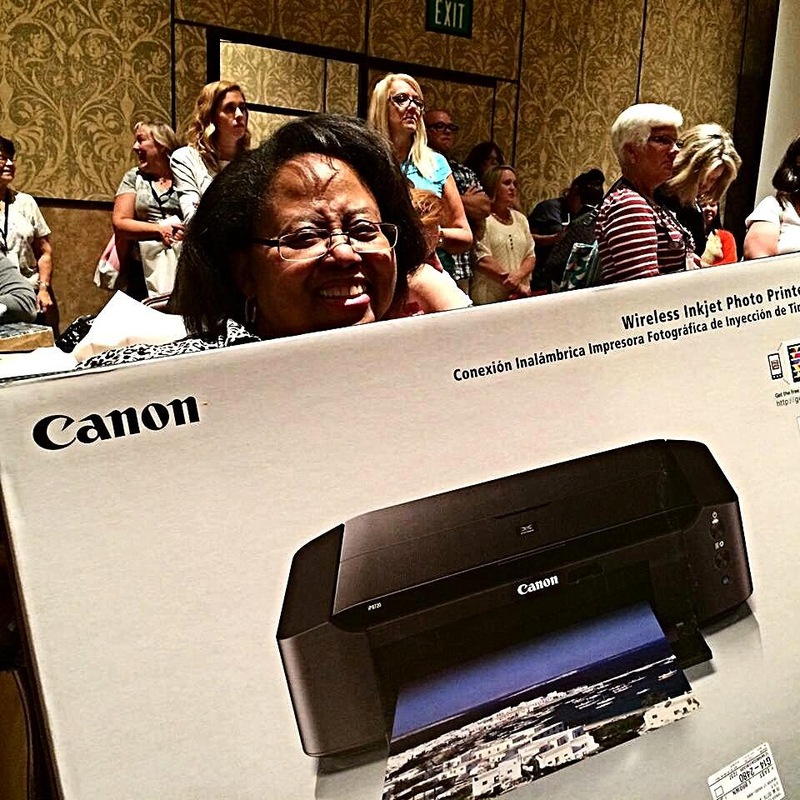 Canon sent Janis to come print out the photos we did from our photo booth. I worked hard to buy a lot of FUN "PHOTO PROPS" and Taylor designed the booth background. Janis printed out so many photos for everyone. It was so touching to see people win so many prizes that night. MONA was in the first winner and her screams got EVERYONE excited. Janet won the "boo"... the CAMEO. It's her new boyfriend CAM. Many had tears of gratitude in their eyes. THIS is why I do what I do. The event was supported with my corporate sponsors but the feelings and event was still heartfelt and will always remain so. I would never have it any other way. The message this year was GOLD. Every single person that came is worth more than GOLD. We need to remember our GREAT worth and to me I want any event I do to be MORE than just paper. 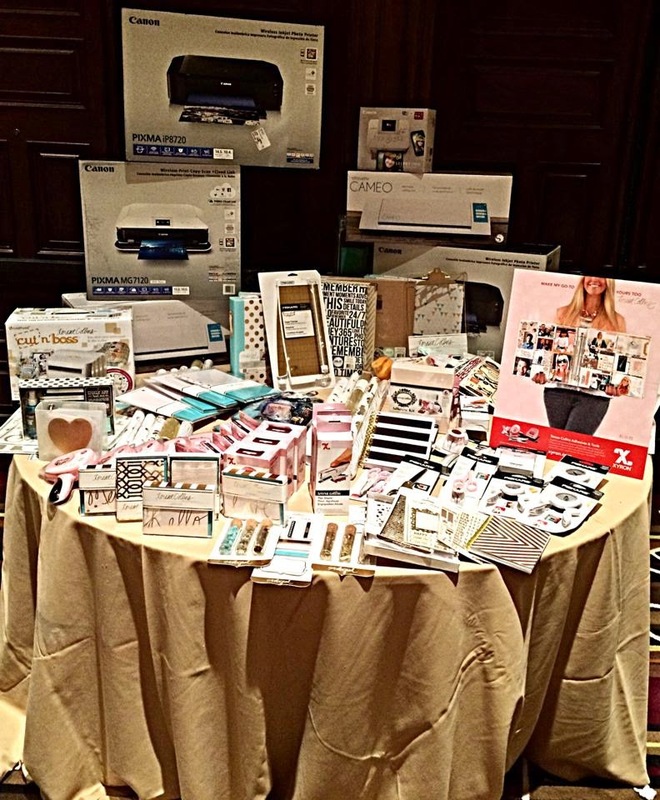 JUST SOME OF THE PRIZES FROM TERESA'S FAVORITE THINGS FRIDAY NIGHT. YES, THIS WILL HAPPEN AT TC VEGAS 2015. THANK YOU TO THE SPONSORS. WE HAD OVER 1,500 PRIZES THIS WEEKEND. FISKARS ALONE GAVE AWAY 700 PRIZES. 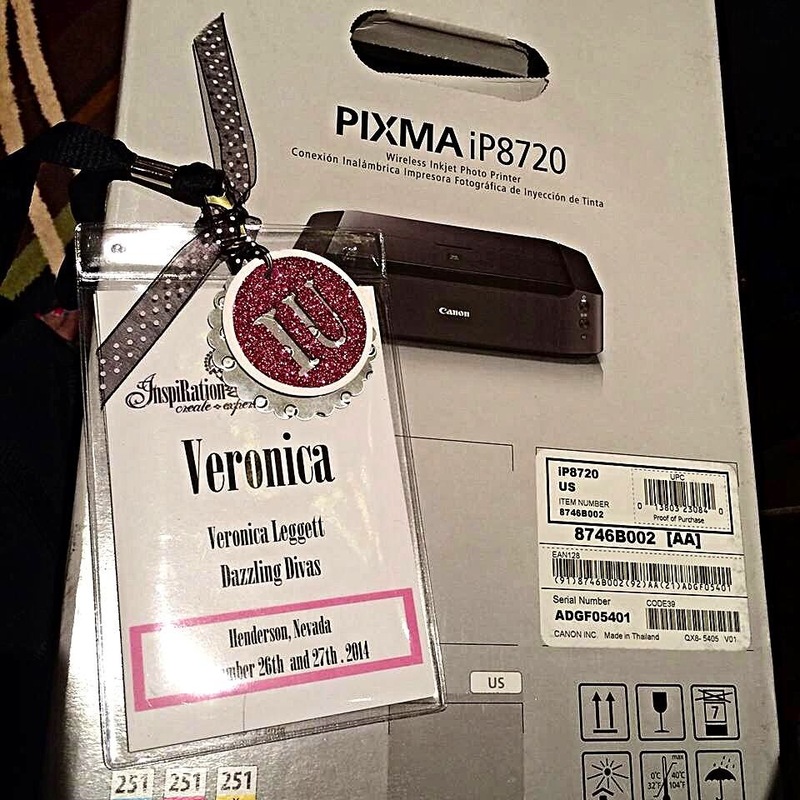 WINNING THE PIXMA PRINTER...IP8720 WAS VERONICA... THIS IS SO HAPPY and recently lost her husband expectantly. She came and this is JUST what she needed. I love you Veronica. I am thankful YOU are BRAVE and came... you are GOLD!!!! Going into next year, the event will certainly change without having Ginger. My event will be the Teresa Collins Vegas event going forward. I am fortunate to have some amazing things happening and growth with my business. My events are a way for me to educate, hopefully inspire and share my creative passion and spirit for LIFE. Life is to celebrated. Life is to CAPTURED. I will continue with the Vegas event much like any other TC event that I am doing. With the support from the companies I have partnered with, I only see brighter things happening in the future. *if you were on the IU wait list for attending- I will honor the number and placement you are on for the TC Vegas event if you wish. If you wish to be off the list, this is not a problem at all and we will delete any requests to do so. If you are on the list, you will get an email to acknowledge and reply that you want to remain on the wait list or be deleted. I have decided to continue with fabulous teachers and guests coming and pre-event workshops. This event will no longer be called Inspiration Unlimited. I have listened to your feedback from those of you who come to the IU event. I will offer pre-event workshops that you have asked for and more. Expect photography workshops, Siloquette, Cricut explorer, and crafting workshops. The teachers for the workshops are excited and I even have another "surprise teacher" that was previously not announced. Later this week you will hear more about the TC Vegas Event 2015. Please address any questions or concerns or sign up to- events@teresacollinsstudio.com. time and I just got on your list. Sometimes change can be a good thing. I am looking forward to 2015 and all that you bring to the table. You rock Teresa and don't let anyone tell you different. You just grow and keep true to you! Thanks for an awesome event and here is to the future....Oh and see you onboard in November! Kinda bummed that no one ever contacted me about wait list, etc. because I sent a number of emails. Hoping this time will be different ... 2015 is the year of Teresa. "My events are a way for me to educate, hopefully inspire and share my creative passion and spirit for LIFE". Teresa, I have to respond to this. This year I had the pleasure and blessing of attending IU for the first time. The classes were wonderful, and I loved playing with all of the pretty products. More importantly, though, I was blown away by your motivating and uplifting from-the-heart talks. I can't remember a time that I felt anywhere near as inspired about LIFE as I did when listening to you speak to us! You are a completely amazing woman who I have so much admiration and respect for. I'm proud to look to you as a role model. Thank you for touching my life in such a heartfelt way. I'm counting down the days until seeing you in Vegas again next year! How do I get on the list? I live in Hawaii & will be in Las Vegas at the same time for my Medicare Birthday Bash Class Reunion (Hawaii high school classmates always have Las Vegas reunions). Just found this event watching My Craft Channel show today. Surgery went GREAT now let's have a WEDDING!!!! MASSIVE SALE- in ONE WEEK !!!! !